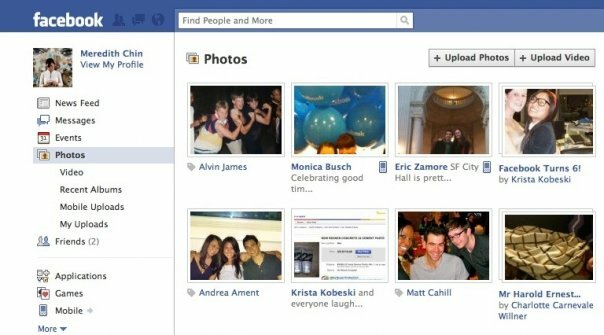 Facebook, still the social network of choice by the young, started rolling out a new homepage design late Thursday focusing on the top menu and left column. Unlike previous overhauls that focused on visual appeal, the new Facebook changes are more about improving site navigation and placing useful information and links on one side of the Web page. Facebook hasn’t said when the new rollout will be complete or how many users have received the update so far, but Inside Facebook is reporting that just 80 million of Facebook’s users have seen the changes to date. Details of the redesign have been posted on Facebook’s blog. The biggest change you’re likely to notice is that the notifications icon, for when someone has written on your wall or sent you message, has been moved from the lower right corner to the left side of the top menu. To the left of the notifications icon are two other icons: one for messages (replacing the current ‘Inbox’ link) and one for the requests to join groups or authorized applications that used to appear in the right hand column. The search bar is now next to these three icons on the left side, and links to your profile, account menu (including privacy settings) and the log out button will remain on the top right side of your screen. The left column is now populated by far more useful information than previous homepage designs, and each link opens to what Facebook calls a “dashboard” instead of a news stream. Dashboards are nothing new, and used to be found by clicking on the icons on the bottom left of the Facebook homepage for thinks like photos, groups, and bookmarked applications. A modified chat link has also been added to the lower part of the left column that lets you known when the Facebook friends you chat with most often are online. To see a complete list of who’s online you’ll still have to click on the chat pop-up window in the lower right hand corner of the homepage. A little further down the left side of the new homepage are new dashboard links for games and applications. Facebook says the new links are supposed to make it easier for you to interact with Facebook applications as well as find new ones. These dashboards will detail your recent activity, highlight your friends’ activity, and alert you when it’s time to take an action like harvesting virtual crops in Farmville or taking care of your digital pets in Pet Society. Facebook also says it has added new privacy controls to the applications dashboard, in case you don’t want any of your gaming or other application activity appearing on your friends’ dashboards. The social network is also working on a way to let you turn off notifications for specific games and applications, while leaving them on for others. Facebook is well known for rolling out tweaks and visual changes to its homepage, and Facebook users are just as famous for voicing complaints about Facebook redesigns. It’s too early to tell if this round of Facebook changes will create a backlash, but at the time of this writing there were almost 3700 mostly negative comments on the company’s blog post detailing the new homepage design.